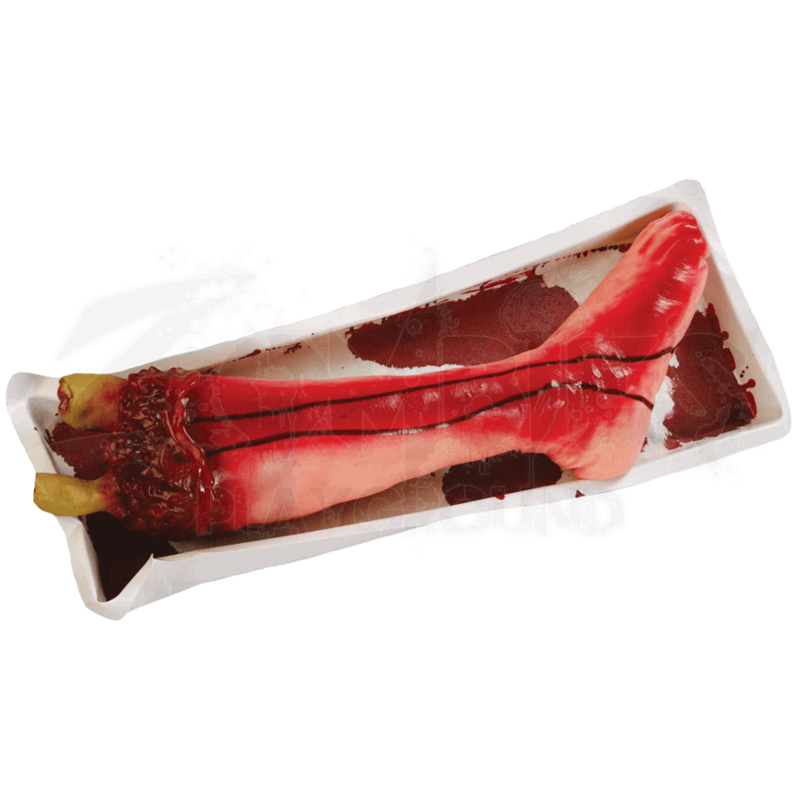 If there was ever a treat made for the hordes of the walking dead, it had to be this Bloody Severed Leg. This grisly shank of meat is a human leg that has been butchered and served up on a white tray for zombie consumption. Of course, there is the matter of finding someone brave enough to offer it to a zombie, although placing it in a zombies path would work just as well. This macabre prop takes the shape of a humans lower leg that appears to have been at least semi-professionally butchered. The skin has a relatively healthy pallor, other than the red bloodstains. Two small trails of blood drip down from the severed stump to the bottom of the foot, while most of the blood shed by the now-amputated limb has been collected in the bottom of the white tray the leg sits in. At the stump, the skin is peeled back to reveal the bloody muscle and tissue beneath, as well as two yellowing bones that look like they have been cleanly sawn apart, rather than broken or fractured. This twisted prop measures 21.5 inches long. If you have been looking for the perfect snack to feast on as a zombie, then you have found it in the Severed Bloody Leg.